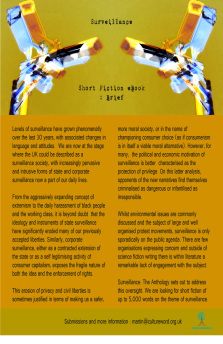 Surveillance: The Anthology sets out to address this oversight. We are looking for short fiction of up to 5,000 words on the theme of surveillance. Levels of surveillance have grown phenomenally over the last 30 years, with associated changes in language and attitudes. We are now at the stage where the UK could be described as a surveillance society, with increasingly pervasive and intrusive forms of state and corporate surveillance now a part of our daily lives. From the aggressively expanding concept of extremism to the daily harassment of black people and the working class, it is beyond doubt that the ideology and instruments of state surveillance have significantly eroded many of our previously accepted liberties. Similarly, corporate surveillance, either as a contracted extension of the state or as a self legitimising activity of consumer capitalism, exposes the fragile nature of both the idea and the enforcement of rights. This erosion of privacy and civil liberties is sometimes justified in terms of making us a safer, more moral society, or in the name of championing consumer choice (as if consumerism is in itself a viable moral alternative). However, for many, the political and economic motivation of surveillance is better characterised as the protection of privilege. On this latter analysis, opponents of the new narratives find themselves criminalised as dangerous or infantilised as irresponsible. Whilst environmental issues are commonly discussed and the subject of large and well organised protest movements, surveillance is only sporadically on the public agenda. There are few organisations expressing concern and outside of science fiction writing there is within literature a remarkable lack of engagement with the subject. Surveillance in one form or another has always been with us, technology has simply extended the range and scope of what is possible. Underlying all forms of surveillance are ideas and beliefs regarding social order and control. For the most part this is codified and internalised through, for example, moral and religious beliefs, and is policed at the most basic level by the family and/or community watching and responding to the behaviour of its members. With the evolution of the modern state the need for control in order to maintain state power and authority, and to maintain the alliances and enmities between states, has led to an increasing emphasis on technology along with a new narrative of ‘good’ and state responsibility. In a sense this is simply claiming for the state powers and authority previously reserved for god(s) – the power to see everything and the authority to decide what is good and bad. In the adoption of this ideology states have been aided by the global rise of corporations and the erosion of privacy in the name of consumerism and choice. Opponents of the increase in surveillance argue that the fundamental reason that modern surveillance exists is to ensure that the interests of a small but powerful minority are naturalised and protected not only by the state but by society as a whole. For the most part we no longer have a vision of what a world without surveillance would look like or what the harmful effects of surveillance are for the majority of the world’s population. To help think about what this all means (whether you agree or disagree!) below are a few examples of the kind of technology driven surveillance that now exists. • National Identity Card – doesn’t yet exist but is favoured by sections of the government, police, etc. Has been argued that photoID cards, such as the driving licence, are becoming National ID cards by the back door. • Supermarket loyalty cards – track purchasing habits allowing the supermarkets to profile customers and ‘target’ services, offers, etc. • Bank/credit card payments – as with loyalty cards, allow the tracking of purchasing habits. • Facebook – monitors everything put on the site and actively encourages users to give up as much information as possible about themselves without any real consideration for privacy or ownership. • Google – as with Facebook, monitors everyone/thing that uses its services. • CCTV – now ubiquitous and seems to barely merit a second thought. Sold on the idea of increased safety whilst showing little or no overall impact on crime statistics. • ANPR (Automatic Number Plate Recognition) – a national network of cameras which are able to recognise and track cars via their number plates. Sold as a public convenience – no longer require a tax disc – but undermines civil liberties, for example used to track and stop cars known to frequently go to legal demonstrations. • Online tracking – most web based services and websites track as much personal data as possible. • Mobile phones & apps – monitor and record location, internet usage, etc. • GCHQ – everything. Monitor and record electronic communications to and from and across most of the UK. Data mining and profiling in order to identify ‘high risk’ individuals and groups. • National databases, e.g. for benefit claims. Of particular concern is the national NHS database (NHS Care Records System) which has attracted criticism for eroding patient confidentiality and anonymity (e.g. when attending a GUM clinic). • NINO – individual ID used to track all activity relating to benefits and taxes. • Filming of demonstrations and use of Liaison Officers amongst crowd to gain ‘intelligence’. • Private Investigators – used increasingly by the public as well as corporations to place people under surveillance for reasons not subject to scrutiny or any real sense of accountability. • Media companies – E.g. News Corp, aggressively pursue and retain information on any ‘story’ they deem to be of interest. Includes clear infringements of privacy that cannot be justified in the public interest. Also obtain confidential information from the police. • The cloud – transfer of more and more software and services online allows more control and more monitoring of both usage and data. The past doesn’t become history until it’s remembered. The Moss Side and Hulme areas of Manchester were for a time not only the musical heartbeat of a city but of a new idea of the nation. In this brilliant collection, featuring short stories, a play and interviews with DJs and club goers, the past becomes history. The music, the people and the community are remembered. Due out in October, PDF featuring 3 of the stories, the first act of the play and 2 of the interviews free to download now. Simply click on the image below.